If you have a Line-X bed liner, you already know just how great it can be to not have to worry about things dinging, denting, or discoloring the bed of your truck. But what about the rest of your truck, or other items that you own that may need an extra level of protection? Get the same level of unparalleled protection your truck bed has for other parts of your truck, as well as other motorsports equipment and tools! Call Line-X Inland Northwest now for a free quote. Our technicians have the skills, training, and equipment to apply Line-X to almost any surface you can think of. If you are sick of worrying about whether something you own will be safe in the back of your truck, at home, or on a job site, contact us for help. If your truck needs a new set of rims and tires or other truck accessories, we’ve got a large selection for you to choose from. Wheel wells. If you spend a lot of time off-roading, or you drive through areas that feature a lot of road construction, protecting your wheel wells with Line-X is a great way to prevent damage caused by rocks and other debris. Bumpers. While bumpers are designed to protect you in an accident, that doesn’t mean they have to look scratched and scuffed up. We can used Line-X to keep your bumper safe and looking good. Doors. Sometimes it can be surprising how certain parts of your truck can get scratched or damaged. The bottom part of your truck’s doors are a perfect example. Use Line-X to add some style and protection to your vehicle. Any other surface of your truck. Seriously, we can coat just about any part of your vehicle with Line-X. Tools. While not every tool needs Line-X, some tools can enjoy a much longer lifespan after we cover them with a protective coating. Lawnmowers. Lawnmowers are exposed to a lot of debris and environmental hazards that can damage them. Boats. 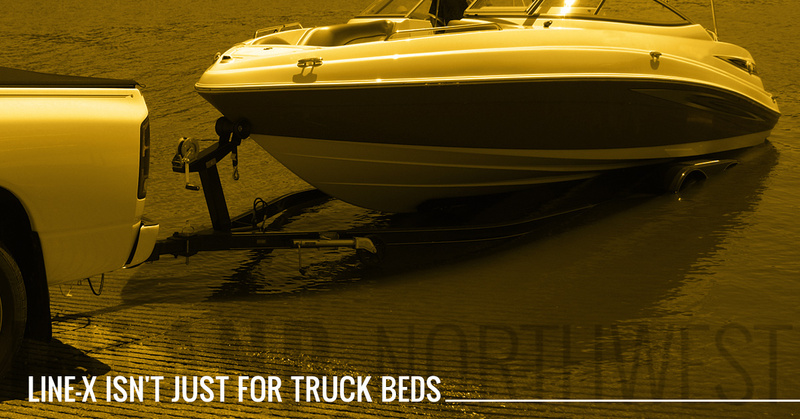 Just like a truck, your boat needs protection from docks, rocks, and other hazards. Trailers. 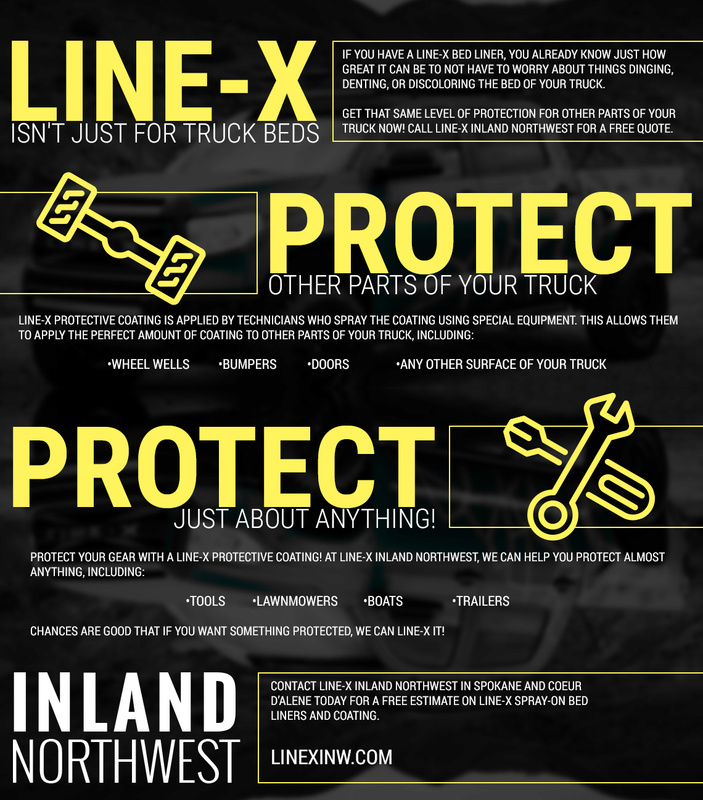 Protect the bed or sides of your trailer with Line-X! Chances are good that if you want something protected, we can Line-X it! 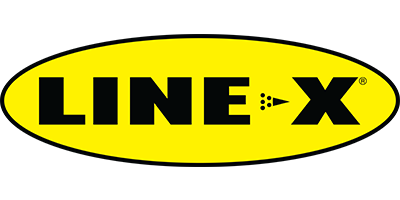 Contact Line-X Inland Northwest in Spokane and Coeur d’Alene today for a free estimate on Line-X spray-on bed liners and coating. We also have a huge selection of other truck accessories that will make your truck look better or offer excellent protection. When you need nerf bars, grille guards, or a new set of truck rims and tires, give us a call. We can put together a free estimate on everything you want.